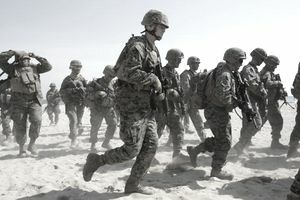 American Marines stormed their first beach on the island of Nassau during the Revolutionary War, and they've been leading the way in expeditionary warfare ever since. Few Military Occupational Specialties (MOS) represent this history of innovation and adventure better than the Landing Support Technicians, MOS 0481 -- or "Red Patchers," so named for the distinctive red patches of fabric they wear on their utility uniforms. As one of the few adornments allowed on the Marines' typically austere field uniform, it's hard to miss. See, during the Battle of Tarawa in World War II, the brass found out just how confusing it can be to drop thousands of troops and tons of equipment on a beach. During such a complex operation, it's easy for the boots on the ground to get a bit turned around. That’s why, according to the Marines’ 4th Landing Support Battalion website, planners decided to have shore party Marines set themselves apart with red patches on their uniforms. To this day, it's still a tradition among Landing Support Technicians, who are the masters of coordinating movement to and from the beachhead in battle. Think of Landing Support Marines as air traffic controllers for the troops, tanks, and supplies on the shore. They form the “shore party” that land on the beach ahead of the combat troops, where they organize the movement of equipment from ship to shore, ensuring everything gets where it needs to go efficiently. But when it comes to tactics, the Marine Corps is about keeping with the times: Landing Support Specialists do more these days than just coordinate ship-to-shore movement. They also “support the establishment, maintenance, and control of transportation throughput systems on . . . [aircraft] landing zones, ports (air and sea), and terminals (rail, truck, and container),” according to the Marine Corps’ MOS Manual. So in addition to coordinating landings under fire, 0481s are on hand to support such large movements as the deployment and return of entire forces in countries like Iraq and Kuwait. I saw first-hand how crucial they were as my battalion, and many others, packed up tons of our equipment to be shipped home after the first phase of Operation Iraqi Freedom. That Marine had a hefty responsibility, but I would have preferred his job to be the grumpy Lance Corporal cleaning months of sand out of the shipping containers and gathering up all the inventory. To become a Landing Support Tech, you need a General Technical score of at least 95 on the Armed Services Vocational Aptitude Battery, and a Mechanical Maintenance score of at least 100. Applicants must be US citizens who, after a background check, are determined eligible for a Secret security clearance. Landing Support is open to high school graduates. After earning the title Marine at recruit training, and attending Marine Combat Training (MCT) for non-infantry personnel, 0481s attend the Basic Landing Support Specialist Course aboard Camp Johnson. That's a little a corner of Camp Lejeune in North Carolina that used to be home to the first boot camp for African American Marines, prior to the military’s racial integration. It’s also convenient if you joined the Corps on the east coast -- you’ll just have to pick up your seabag and walk across the street from MCT. Marines in other career tracks can be designated Landing Support Specialists, if their unit needs more, after six months of on-the-job training. However, they won’t be permanently assigned to the 0481 career track — for promotion and assignment purposes, they’ll still fall under the MOS they were school-trained for. Given the nature of the job, Landing Support Technicians should prepare to go on frequent deployments, both to combat zones in the War on Terror and for training cruises and exercises, such as those conducted every six months by Marine Expeditionary Units. Career Marines who reach Staff Non-Commissioned Officer rank (E-6 and up) may also be called on as “Combat Cargo Assistants (CCAs) onboard naval amphibious assault ships” (MOS Manual.) Marines in it for the long haul may eventually advance to MOS 0491 — Logistics and Mobility Chief — at the rank of Gunnery Sergeant (E-7). Like all other Marines, 0481s must continuously develop essential skills outside their job specialty through Professional Military Education. Furthermore, special duty assignments like Drill Instructor, Recruiter, or Marine Security Guard provide a break from the usual routine of the job. More importantly, they give you an opportunity to diversify your career portfolio and stand out when competing for promotion. For life after the Marine Corps, the American Council on Education recommends experience credits for computer applications, supervision, transportation management, and business communications. Military.com’s Military Skills Translator suggests such civilian careers as Shipping and Receiving, Merchandise Planning and Buying, and Operations or Plant Management.